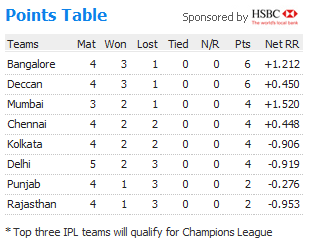 Having missed to write about Day 15 in IPL 5, nothing much as gone past though. As KKR picked up their 3rd win for the season, skipper Gambhir being the role model as he lead from front with a match knock 66* from 44 balls. Earlier KXIP failed to impress, though they had a win over the same opponent couple of days back. Gilly’s Hamstring didn’t help the course for KXIP as well. How ever KXIP finished with 124/7 in their 20 overs. KKR chased with ease, Skip scored 66* and well aided by Kallis with 30*, Gambhir will finally have a laugh in face after having losing the close games. Unfortunately this was never a one, as it ended with 21 balls to spare. Another day with different set of options for Deccan Chargers but the result didn’t have much change, It was the same as the three before, but it would have been very different if not for a man called Pietersen from England, who changed the course of Delhi daredevils and went to score his Maiden T20 century in 64 balls to win the game for Delhi. Chennai made three changes in their line up, very rare sight though, they dropped Yo Mahesh, Albie Morkel (have to leave, due to unexpected demise of his friend back in SA ) & Murali Vijay who find it very hard to fit into the opening line up. New Opening pair, Faf & Badrinath walked with confident and gave the best opening stand for the IPL 5, with 116 between them. Late assault from Dhoni,Bravo & Jadeja ensured CSK got 164/5 in 20 overs. Pune warriors knew this isn’t going to be an easy chase, it became more difficult when man of the match Kulasekara’s spell sent both the opener back into hut with in 4 overs time, from then on every one got a start but regular strike by Chennai bowlers kept Pune under control all the time, and never eased. Finally Dhoni & co leveled Dada’s men 1-1 all to win the game by 13 runs. – Bhuvaneshwara Kumar bowled the 7th free hit of this season, and Badrinath ended scoring a single in it and Ashwin bowled the 8th one and Mathews took it for a boundary. – First 100 run partnership for Chennai Super Kings for this season. – Pietersen scored the second century for this season, 103* against Deccan Chargers is also equals the highest score for this season along with Ajinkya Rahane who scored the same 103*. – Pietersen became the 20th Batsmen in the IPL history to score a century. 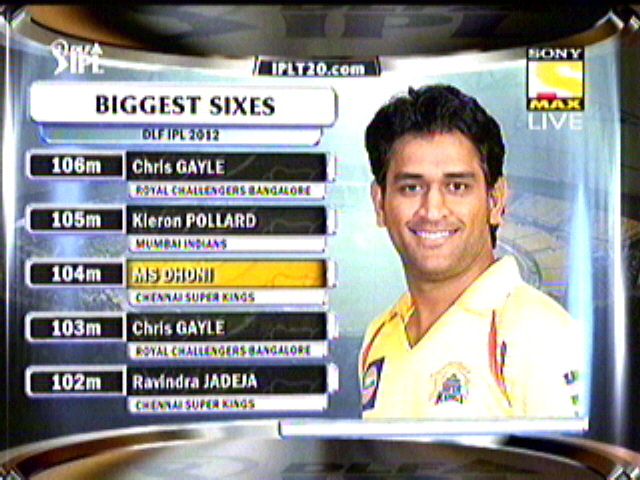 – 9 sixes hit by Pietersen is the highest no of sixes hit by a batsmen in an innings, he bettered Gayle’ 8 sixes. – 116 runs scored between Faf du plessis & Badrinath is the highest first wicket partnership for this season and also the second highest partnership for any wicket, falling behind 121 runs scored by Rahane & Shah. Gilly won the toss ande decided to Bat first, didnt have the best of the starts just lost Mishra in the very first over, Gilly and Gibbs played their Natural game and kept the scoreboard ticking…After gilly’s Departure, Symonda joined the party but the icing is done surely by Rohit sharma, who was sedated a bit in the beginning but did his job perfectly to finish with a total of 171/6. DC 171/6 in 20 overs. DD 161/9 in 20 overs. DC WON MATCH BY 10 RUNS. 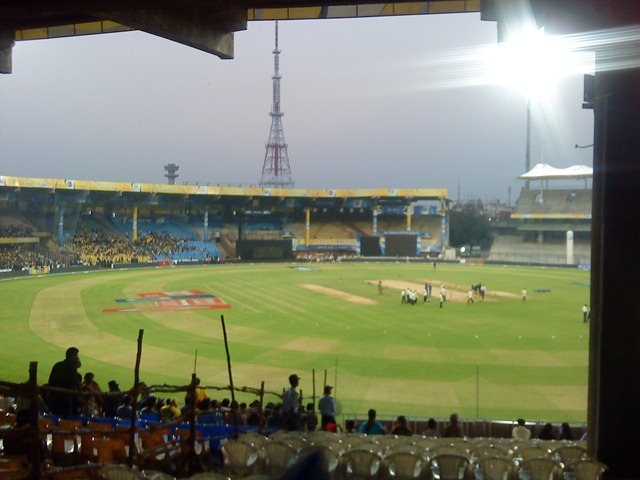 How did i make it to MA.Chidambaram to see Match…? I gotta admit the fact, till this long time i havent seen a match in stadium. So the eagerness was always there to watch, but didnt get the right time. Finally this week, Its my Fav IPL with a Match in Chennai, so started searching for tickets here and there, tried in online, but to see that all were sold out and i was left with No other option to see it in small screen. All of a sudden ITC (place where i am working) was busy with IPL tickets revolving around the office, so i tried my luck over ter too…. But wasn’t so lucky enuf, as all the one’s i asked were interested for their seats. Finally , Finally, its my friend and collegeus Swaminathan who was able to crack the pot with 1 IPL ticket, but he wasn’t interested to go alone, so he really took hell lot of effort to get one more and oh he did succeed in milking down another Rs.2000 ticket. 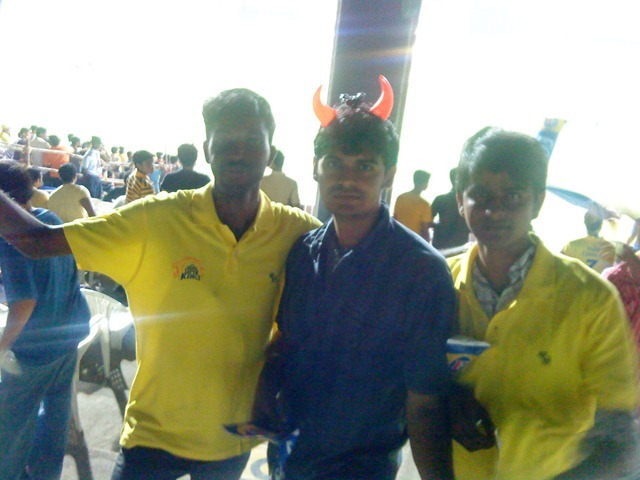 So both of us were really happy and excited to see IPL… Even if i had bought in online i wudn’t have spent more than 500 bucks, Somehow, Thanks to ITC and Swami, i am now with a Rs.2000 ticket with me. Here is the glimpse of it…. But the worst thing is today, we had a internal training program going on, which will be over only in the eve, so gotta wait… Training program got over by 5 and myself and Swami went to his friends house in royapettah for watching match. From there we took a Auto to reach stadium, which is buzzing with heavy music all around and ppl was crowded everywhere, myself and swami went in search of CSK T-shirt and finally made a deal for 150 bucks and got one for each. As we are high priced, we got in very easily, within 5 mins of formal check ups we are into the stadium with a incoming crowd cheering the tamil songs. I guess it clocked 6.15… Not much of a crowd in my stand, very few, and we are enjoying the music and cheering now and then… Just a glimpse of the ground from the place where we sat. Inform Pathan and Bopara walked out and Albie started the things for CSK. Gony started the second over and runs started flowing from his deliveries… Its certainly encouraging to see crowd cheering every dot ball bowled, which really meant its value… Every now and then we cud hear a sound (to too tooo) and all will shout along with it… This is also new to me, being a new person, i was puzzled how come all are shouting exactly at the same time, later swami revealed me the trick.. And in the third over, Morkel removed Bopara as balaji took a very good catch in the third man region… Due want me tell how was the ground… Gony once again came back to leak runs again. Sangakarra was kept idle for some time b4 he lofted one over third man, but this time Gony being the culprit who grassed it… Murali was bowling really well from our end, which is gr8 to see… And he did remove his former skipper Sangakarra with the delivery which looped in and patel did the formalities. All of a sudden wickets fell in heap as balaji took pathan and murali removed another srilankan Mahela. Yuvi kept the hope alive for KXIP with fours and six then and ter… In the middle Justin Kemp walked off the field with a strain in the legs, which meant CSK was a bowler short too… Raina as a skipper took that part too… Later in the innings Kaif went to accelerate the score and paid the price, Murali being the benefiter.In end, KXIP punjab scrambled somehow to a score of 136/8 in their 20 overs. I was very much satisfied with the home teams effort and very much confident that they will get their 6th win over KXIP. We both didnt feel hungry and just stayed their without going for any break. KXIP 136/8 in 20 overs. CSK 136/7 in 20 overs. CSK 9/2 in 0.5 overs. KXIP 10/1 in 0.4 overs. KXIP WON THE MATCH BY SUPER OVER. Just b4 sleep, My hands were paining, throat was very soar, i was totally exhausted but nevertheless my heart was full and without any doubt i had a best exp in my life… Thanks to ITC and Swami a lot…. – KXIP registered their first ever IPL Win over CSK in the 3 yearsof IPL. – KXIP and CSK have met previously in 5 occasions and all the time CSK being the winner. – Rohit Sharma scored the 150th six of IPL season 3. – Delhi conceded more sixes than any team as they top with 36 in their 5 games. – Delhi conceded just 2 runs as extra which is their best. Purple Cap – Chaminda Vaas (8) followed by Muralitharan, Andrew Symonds and Praveen Kumar with 6 wickets each. Finally its time for Knockout situation, and Do or Die battle for the teams, First up is Delhi a team who are on a roll and won maximum no.of games in this tournament and on the other side, team who made into semi’s with the help of KKR a bit, (KKR defeated RR in a very important last game, which allowed DC to get in), not a gr8 confidence to go into semi’s. Pitch report said, its a 160-170 track and captain winning the toss will definitely Bat first, But, on the contrary Gilly won the toss and decided to field first (just for ur remembrance, Dc lost lost 3 out of 4 games chasing, except against KKR, which was won by Rohit’s Magic), Really a brave move by Gilly and asked to shewag to take strike… Man O Man, Ryan Harries bowled a fabulous first over,he got rid of both the openers for duck and created a Maiden, a disastrous start for delhi… Not to mention, Gilly and the whole team was in Cloud 9… Then came Skipper Shewag and Dilshan to build the innings, Dilshan had an early reprival of missed run out by Harris. Till the half way mark, both kept the innings going with some scintillating shots on all side of the wickets, esp shewag’s trademark shots are awesome to watch. Delhi were 83/2. Its really a gr8 comeback after a maiden double strike first over. Once again Strategic break worked on the favor of bowling team as symonds got the prize scalp as Shewag, who needlessly tried to push a middle stump delivery for a single moving way across the stumps and finally giving trouble to umpires fingers. Surprisingly Shewag went without scoring any six today. Once he is gone, Dilshan and Ab de villers were greeted by some really smart bowling by DC, which doesn’t give any room to free their arms… Except these three, no one else crossed double figures which says the rest. Dilshan scored a well made 50 to get Delhi to a defend-able total of 153. Their main prob was, they lost 4 wickets in last 2 overs, which didn’t really help the score to go up… Actually credit to deccans’ who bowled exceptionally well, esp Harris who picked 3 wickets, RP singh had couple in the last over, and others too did a fair job for a T20 game. – Gilchirst recorded the quickest 50 in just 17 balls in IPL. which is also the 5th fastest in T20 games. – Gilchrist’s strike rate of 294.11 when reached his half century is the highest ever in IPL cricket while scoring a fifty. Previous best was combined held by Yusuf pathan and Brendon McCullum. – 21 scored in the first over of Deccan’s innings, the second best in the tournament – Rajasthan had scored 22 against KKR. – Gibbs scored his 4th duck today which is the most in the tournament by any player. – This is also the first time Deccan’s have beaten Delhi in a IPL match in both seasons. – Deccans have scored 2,111 runs in the league stage games, which is the highest in IPL 2. – Opening pair of Gilly and Gibs have 505 runs in 14 innings, which is also the highest by any pair in IPL. Its all one man stats seems to be…. sorry nothing i can do abt it… Hail Gilly…. IPL 2: Day 26 Review.. Its DC Vs DD.. Almost a berth in Semi’s Delhi would love to seal their berth with this win, on the other end, Its Deccan’s, who need this win to get their place in semi’s…. Its almost a playoff for the semi’s berth. Gilly won the toss and decided to bowl first, Surprise, Shewag didn’t open for delhi, its warner and Gambhir, Warner went for a expensive pull shot and got in the mid off easily. later dilshan gave a simplest ever chance to rohit sharma, when he failed to grab that, he meant, how important catch they have missed, taking sixth over the game to 24 runs. Even though he was after a very short cameo, he did his work. But on the other end, its gambhir who is really struggling to find the form finally ended his misery innings with a shot lofted to long on. In the end, its AB and Karthik’s show, both really made bowlers to pay a lot, esp karthik took chaminda vaas’s last over to 23 which really the turning point of the match. With a good show, Delhi ended by getting 173/7, (the same score that KKR made yesterday). Looking down to chase more than 8 an over, gilly started the things in his own fashion, picking the gaps and punishing the bowlers with out any mercy, Sangwan ran over couple of wickets in the front, but nothing halted the proceedings of Deccan’s and its just a man, gilly taking all, all over the park in Kingsmead. Then came the killer break (i mean strategic time out), which really breaked the strategic formed by gilly, but he brought in a right replacement for his shoes, its symonds, took the place of another Australian, and looked at ease while playing the delhi bowlers. To say Deccan’s had the match in their pocket till 17th over (where they needed 25 in 18 balls with 6 wickets in hand), then came the unexpected surprise, Rajat Bhatia from no where bowled a superb over to remove Symonds and Smith and giving away just 3 in that over, later nehra chipped with 2 wickets in 19th over, last over Bhatia finished the things off for deccans, picked the rest 2. Which means, Deccan’s lost their last 7 wickets in the space of 17 deliveries and for 12 runs. Which means, Delhi won the match by 12 runs. and remain firmly in the top of the table. Winners are two localities Bhatia and Sangwan for dashing figures. – Run out of RP singh by DD,is the 14th in this tournamanet by them, which is highest by any team in IPL season 2. – 3/18 is the best figures for Pradhep Sangwan in T20 cricket. – 4 catches dropped today, 3 by Deccans (rohit, ravi teja, and rohit) and 1 by delhi’s Ab de villers. – 4/15 is the best figures for Rajat Bhatia and also by any delhi bowler in this season of IPL. – Vaas recorded the worst bowling figures of this IPL season, 2/52 in his four overs. – Run out of RP singh by DD,is the 14th in this tournament by them, which is highest by any team in IPL season 2. Its a Clash of Titans, Top two teams in the table play against each other…. As the opening wasn’t gr8 for the past few games, same continue today too, Gilly after smaking nannes for couple of boundaries got carried away and lost his wicket, then gibbs went back with a duck, and batting wasn’t so gr8 by deccans’s today. they were very much clumsy, till Dwayne smith played a gem of a cracker to rescue back DC from a gr8 trouble which they were in. 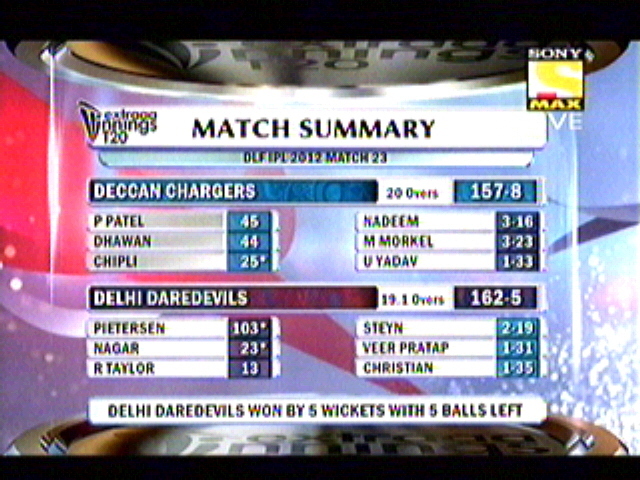 But in the end it all ended up just short of 150 and delhi shud have felt a straight fwd chance to win the match. In bowling its Nannes (4-0-16-2) bowled his heart out, took the wicket of Gilchirst after he took him for a couple of boundries, then he took in form gibbs too in his next over, which really turned the game towards delhi, all the credit to him. Other than him, Nehra, vettori, sangwan all chiped with the wickets. Chasing just 7.5 an hour, Shewag and gambhir went after the bowling of deccans, but when shewag was abt to take the game away, deccans struck two quick blows removing both shewag and Ab in the span of 2 overs. and very soon joined them after a LBW to his name. But then, its left to dilshan and dinesh karthick who carried the way for delhi to the victory, unfortunate, dinesh karthick cudn’t stay till the end to finish off the game. but its dilshan, who took fidel edwards in black and white after being hit by a bouncer. which ended the match and as a well made 52 for dilshan. bowling ahmed got 2 wickets, purple cap doesnt seems to have a shift today, since RP singh cudn’t really make break thru’s. In the end, it s Delhi daredevils won the match comfortably with 8 balls to spare, and they have beaten the undeafeated team in this season. 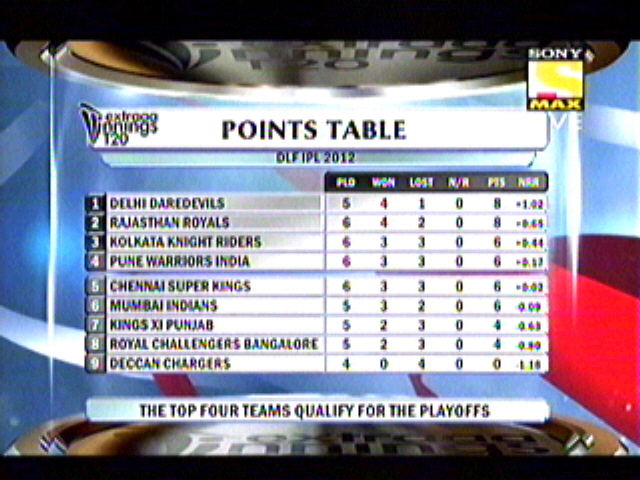 which points table open to all the competitors. This game win is much necessary for both teams to stay in the semi’s hunt. Shane warne won the toss and after having a deep look over the wicket he decided to field first, and it did seems to work, opening partnership in DLF IPL doesn’t seem to work again, and this time its orange cap holder Mathew hayden gone for a 1. And patel followed him up. But its has nothing to do with Raina, runs started raining from his end, well supported by badrinath. After strategic time out, badrinath fell to warne and runs started to stop a bit, scoring just 23 runs in 10-15 overs gap. but both dhoni and raina made up for it in de slog overs with some fabulous shots. Raina had a very fair chance of making a century, but with a mistaken scorecard, he went out for a shot, and missed it in de last over. Anyways, its an excelent performance for him in a tough pitch to bat on. While to talk abt bowling, Yusuf picked a couple and warne chiped in with one, rest where taken a back by raina’s power packed performance. Chasing 165 wasn’t an easy job, in this pitch, and this is third time i had to write today, again opening failed, and grame smith fell for 2 to his country man Albie morkel. 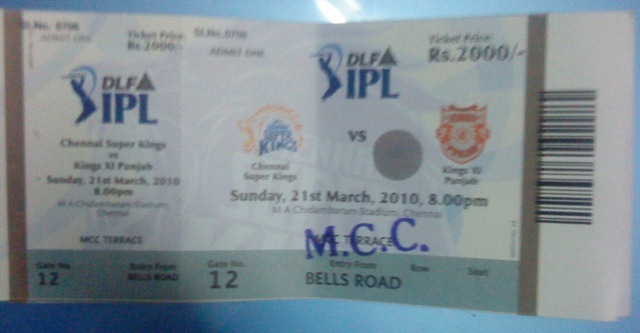 from then, it wasn’t conviencing enough for royals to battle out chennai’s bowling attack , it was too good to handle. (really surprised to see a big change in bowling) Yusuf and Jadeja tired their best, but its al out their hands, before they cud make a move. 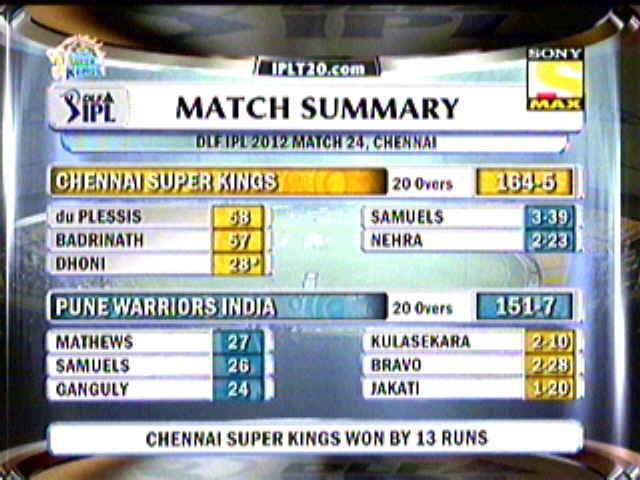 so Chennai cruised to a first win against RR. with 38 more runs to get. As i was mentioning, bowling did really come good for chennai today, Balaji picked up his 4 (3.3-0-21-4) and morkel came with twin strike in beginnnig and followed by oram and rain to have their names in the wicket takers list. Anyways good game, but script was written very well and Raina is the hero of the day. Hats off to him…. 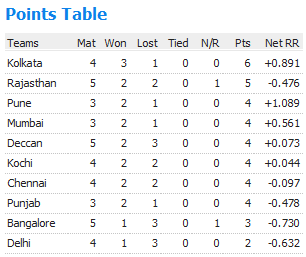 Chennai hope to pick up a few more wins to be in the top 4. but this contest is wide open for all…. – This is the first time CSK has defeated RR in IPL league. They have lost all three matches (2 league and 1 finals) in the previous season. – Suresh raina bettered the performance of Ab de villers, in Most runs from fours and sixes in an innings, raina scored 70 runs (10×4 and 5x 6), Ab scored just 56 out of his 105. – Jakati is the only player chosen in the team as a specialist extra spinner and he didnt have chance to bowl r either to bat in the game.